Kamar Baldwin goes up for a layup. @ButlerMBB. 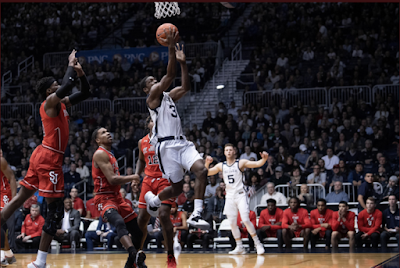 St. John's was dominated throughout by the Butler Bulldogs on Saturday afternoon in Indiana, on the way to an 80-71 loss. This leaves St. John's at 3-4 in Big East Conference play, continuing their uneven play in January after a 12-0 start in non-conference play. 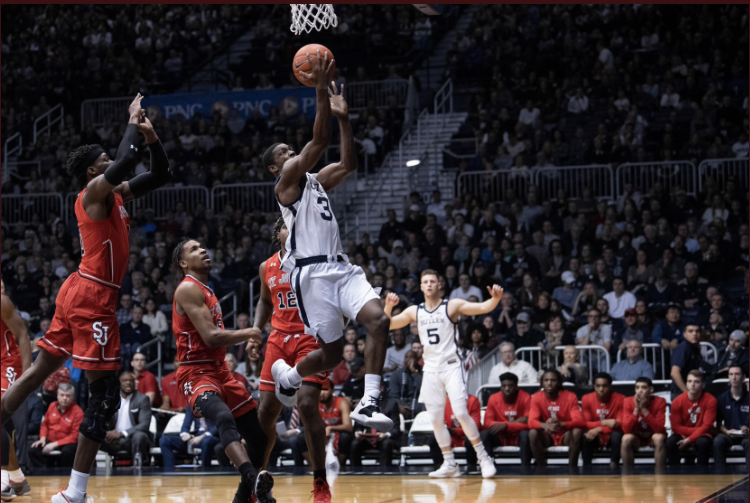 Butler was led by Kamar Baldwin, who poured in 30 points on 10-18 from the field, including 2-6 on three-pointers, with 8 rebounds and a steal. Jordan Tucker had 24 points off the bench on 8-17 shooting, and a superb 6-11 from behind the arc, with 6 rebounds and 2 assists. Sean McDermott was a beast on the boards, with 12 rebounds on the afternoon to go along with 7 points (2-3 FG, 1-2 threes). Butler shot 45.9 percent (28-61) and 11-15, or 44 percent, from behind the arc, in this one. They held St. John's to 38.1 percent (24-63) shooting overall and just 29.2 percent (7-24) from behind the arc. St. John's was led by Mustapha Heron and Shamorie Ponds, who each had 20 points. Heron shot 6-13 from the field, including 2-6 on three-pointers, with 8 rebounds and an assist. Ponds shot 8-19 overall and 2-9 on threes, with 2 assists and 2 rebounds. Butler took over this game early, jumping out to a 22-10 lead on a Jordan Tucker three-pointer halfway through the first half. They led by as many as 13, and took a 39-27 lead into halftime. In the second half, a Joey Brunk dunk at the 16:27 mark made it a 16-point game, 50-34, and a couple minuted later a Tucker three-pointer made it a 58-36 Butler lead. St. John's responded with a 12-0 run capped by a Sedee Keita dunk at the 11:26 mark, and then pulled within eight, 64-56, on a Heron three. An LJ Figueroa layup at 6:25 pulled St. John's within six, at 66-60, but that was as close as they got until the final minute when Heron drained a pair of free throws to pull them within four, 73-69, with 50 seconds left, and Butler made seven free throws from that point on to seal the win. “I thought our energy was not up to par," St. John’s Head Coach Chris Mullin said afterwards. "At the start of the second half, we fought back well but we need consistent energy. St. John's is off until next weekend, when they renew their rivalry with Georgetown at Madison Square Garden on Sunday, January 27 at high noon.